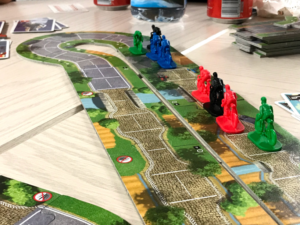 Concepts: Flamme Rouge is a bicycle racing game – but if that doesn’t interest you, don’t tune out just yet. It didn’t interest us much either, but when we gave the game a shot we found that it offered a lot of fun. Sports games are tricky, because if the players aren’t really interested in the particular sport in question (and let’s be honest, most gamers aren’t exactly the sporty sort), you have a hurdle right at the start which needs to be overcome in order to simply catch their interest. 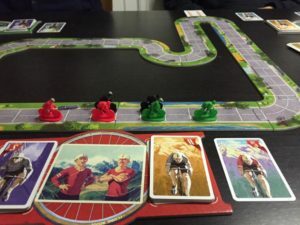 There’s no doubt that this game’s core concept will appeal to cycling enthusiasts, but it’s the core mechanics that appeal to board game fans first and foremost, because they offer an exciting and tense racing experience. Writing: The game is set during the early 20th century but the storyline is mostly irrelevant. Instead we will discuss the instructions for the game, which were written in such a way as to be clear and easy to follow. They were also laid out in a manner so that the players can set up the game and launch right into play whilst reading through the manual, which is always a huge plus when you’re playing for the first time. Mechanics: Each player has two racers of their respective colour – a rouleur (intended to maintain a steady pace) and a sprinteur (intended for quick burst of speed), along with a deck of cards for each of those two racers. Your two racers work as a team throughout the race. The board is set up from a modular track. Each turn, all players draw a hand of cards and from that hand they choose one card to play for each of their racers. All cards in the game have a number listed – and as you may be able to intuit, the rouleur and sprinteur decks contain those numbers in different quantities to reflect each cyclist’s intended function. After you play a card and move your model the indicated number of spaces along the track, that card is removed from the game. Therefore, players will be required to manage the high numbered cards to ensure that they are not wasting them. After movement, racers near the back have the chance to push forward, ‘catching the slipstream’ as long as they are not trailing too far behind the rest of the pack. Meanwhile the cyclist in the lead receives an ‘exhaustion’ card – a card with a terribly low number – and places it into their deck. This means that if a player continually holds the lead, they will eventually tire – drawing more and more exhaustion cards which will soon limit how far they can travel. Between these two mechanics, the game ensures that no player is left behind for too long, limiting the potential for lucky hand draws and ensuring that any player can edge out a victory if they are strategic enough with their card management. Design: So let’s talk presentation. Flamme Rouge has a lovely aesthetic, with pastoral countryside scenes depicted on the modular racetrack. The cards are coloured well, with both rouleur and sprinteur cards different shades for easy visual understanding, whilst the exhaustion cards are a grim and painful crimson. The miniatures that come with the game are functional and it’s easy to tell which racer is which, and the colour choice for the four players is strongly differentiated enough that any player who might have difficulty with colour blindness can still identify them easily. 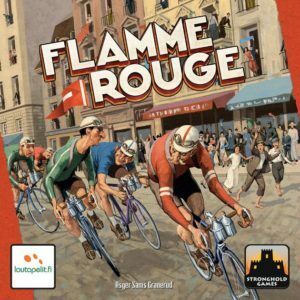 Playability: Flamme Rouge is one of the most playable racing games that we’ve seen to date. Often with racing games, there’s the risk that one lucky player will simply push ahead at the start and maintain a lead throughout the game, but the rubber-band style mechanics that are built into Flamme Rouge minimise that, and as a result ensure that each game is highly competitive. Players always feel that they are just barely edging their way towards victory! Even with that taken into account, the game is very focused on card management – players have two different decks of cards to draw from, and need to remember that they each contain different numbers of high and low cards, which is easy to forget in the pace of the game. At some points, players may want to fall back and ride the slipstream in order to avoid spending high cards, holding those high cards until they can make a break for the end. But do that too much and you might struggle to make that final push when the time is right! It’s a fantastically strategic game. All of that, though, is without even mentioning the modular board. The racetrack itself is adjustable and comes with a variety of different environmental hazards! Perhaps you’ve grown used to the standard game and want to spice it up by adding wet roads, slippy conditions and so on? Yeah, you can do that. Conclusion: We genuinely loved Flamme Rouge, in part due to the excitement that it brings to the table. It’s a racing game that strives to have an exciting pace, and it accomplishes that fantastically. When you play the game, you always feel as though you are scrambling for the finish line, pushing ahead by just one more inch. Each game that we have played has ended in a very narrow victory for the winner, one that feels as if it was just barely won over the others – and that creates a lot of excitement. FINAL THOUGHTS: If you enjoy racing games in which you charge off into the lead, leaving your fellow players choking in your dust, this probably isn’t for you – but if you like edging out an exciting win by the skin of your teeth, this is the racing game for you! And hey, if you don’t like cycling, you can always pretend it’s a Mad Max style dirt-bike race through an apocalyptic wasteland – it’s the mechanics that make this game fun!